Dec (J2000): +62 degrees 26' 05"
This modest looking target is perhaps one of my favorite astroimages due to its delicate nature, its rarity, and the rich field of colorful stars. 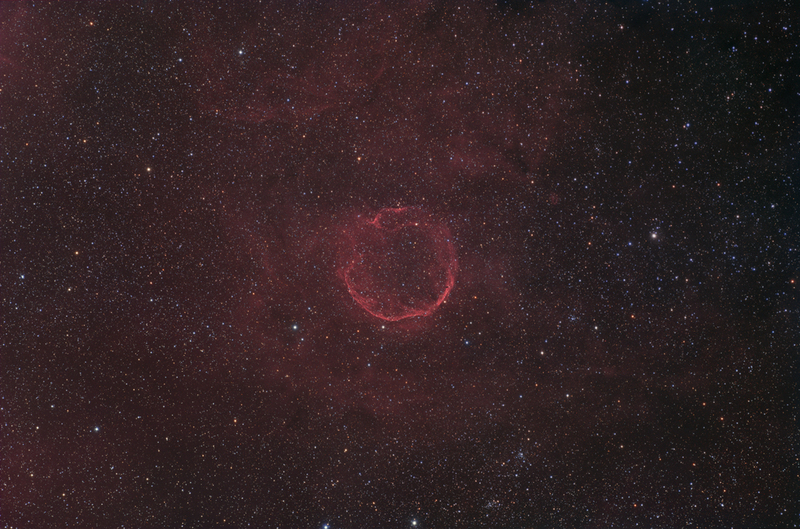 CTB1 is an old supernova remnant similar in its shell-like structure to the Cygnus Loop. The filamentous edges are created by an expanding shockwave resulting from a supernova explosion, which slams into surrounding dust in the interstellar medium, ionizing gases such as hydrogen, oxygen, and sulfur, which emit specific wavelengths of radiation during electron recapture. CTB1 has been extensively studied in both optical and radio wavelengths, with similarities and differences to the Cygnus Loop described in this article. Unlike the Cygnus Loop, the majority of CTB1's optical light emission is in the HII spectrum, with only a small component of OIII emission. Another difference between the two SNRs is that CTB1 is very, very faint compared to the Cygnus Loop, with this image requiring 6 hours of Ha exposure in order to obtain sufficient detail. The expanding border of CTB1 appears discontinuous, with a "break" at approximately 11 o'clock in the above image, giving the illusion that it is emptying its contents into surrounding space. The region is full of colorful stars of the Milky Way, as well as numerous star clusters as labeled in this image. Although it is a beautiful widefield target, it is surprising that this region is not often imaged by amateur astrophotographers, perhaps due to its faintness. Given the delicate nature of this object and its faint magnitude, I purposefully avoided "overprocessing" this image. Feel free to explore the larger sizes of this image (links above), which show a nice amount of filamentous detail in the shockwave front of this SNR.